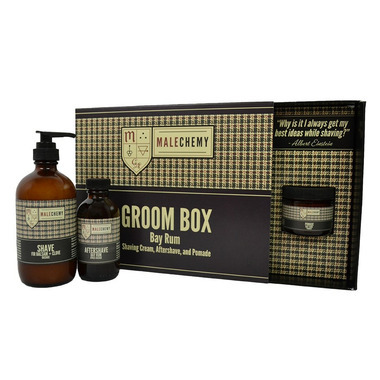 A gift set for him that includes everything needed to keep skin smooth and hair coiffed. A foaming shave lotion formulated with gentle ingredients that soothes skin, combats redness, and has a silky smooth texture that provides great glide and won't dull razors. Soothing Bay Rum aftershave that uses tea tree hydrosol, aloe vera and witch hazel to calm, purify and close up pores after shaving. And a wax styling product that holds hair in place with a slick, darkened shine. Shave - Virgin coconut oil (organic), coco glucoside, glycerin, cucumber, aloe leaf juice (organic), xanthan gum, sodium levulinate, sodium anisate, tocopherol, fir balsam essential oil, vanilla essential oil, clove essential oil (organic). Aftershave - Tea tree hydrosol, witch hazel hydrosol, organic aloe vera, bay rum essential oil (organic), bergamot essential oil (organic), clove oil (organic). Pomade - Virgin coconut oil (organic), cocoa butter (organic), shea butter (organic), candelilla wax, castor wax, vitamin E, bay rum essential oil (organic), bergamot essential oil (organic), clove oil (organic).